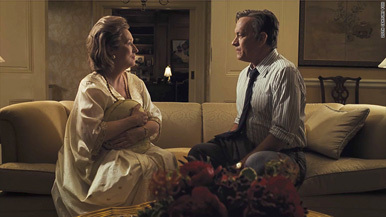 The Post is an interesting film in that it’s a small tale writ very, very large. It’s not hard to imagine the story told in Steven Spielberg’s historical drama rendered instead in a one-set stage play or low-budget indie; instead, it’s ... well, it’s a Steven Spielberg movie. It’s like hiring a globally renowned architect to design a single-family home. Which is not, of course, to insinuate that The Post is not an important film. It is, rather, a perfectly timed reminder of the role, necessity and inviolability (at least under the U.S. Constitution) of the press. Its action — a series of interoffice decisions at the Washington Post — is limited; its implications are grand. At the titular paper, new publisher Kay Graham (Meryl Streep) is attempting to navigate the business world as the Post prepares to go public. Meanwhile, old-school editor Ben Bradlee (Tom Hanks) is trying to keep pace with the New York Times, which has just published one of the great bombshells in journalistic history: a series of leaked government documents revealing untold truths about the ongoing Vietnam war. Reporter Ben Bagdikian (Bob Odenkirk) manages to track down the documents in question, later to be dubbed the Pentagon Papers. This leads to an unexpected showdown, however: If they publish information from the papers, the Post risks financial ruin and legal disaster, as the Nixon administration has begun efforts to attack news outlets that print the info. If they don’t, in a not-at-all-metaphorical way, the first amendment is demolished. Well, sort of. This story belonged to the Times as much, if not more, than it did to the Post. But in placing the Pentagon Papers against the backdrop of Graham’s ascendance as the paper’s first female publisher (with refreshingly understated nods to the present day), what might have been a procedural of publication becomes a true drama. And one with some of the best artists — from Spielberg and composer John Williams through the absolutely loaded cast — hard at very dutiful work. A preface and epilogue — a trip to Vietnam with Daniel Ellsberg (Matthew Rhys) and the opening moments of the Watergate scandal, respectively — are superfluous, one of many areas where The Post suffers in comparison to the superior, if less timely, Spotlight. Nevertheless, rarely do well-made films arrive at such opportune times; it’s fortunate that this one was delivered by supremely capable hands.